Vanalee Village. 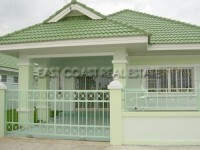 This 3 bedroom, fully furnished house is set within a small village environment with security and large communal pool. Located to the East side of the North Pattaya area, it has easy access to all major routes, including the Bangkok Motorway, Highway 36, and Sukhumvit Road. Just a 10 minute commute into Pattaya City, or a 20 minute journey to most Eastern Seaboard estates. The house has a modern open feel, with a nice large fitted kitchen, bright and airy living room, terrace area, and small landscaped garden. Offered with rental contracts longer than 6 months, and at a favorable rental rate of just 12,000 Baht per month.